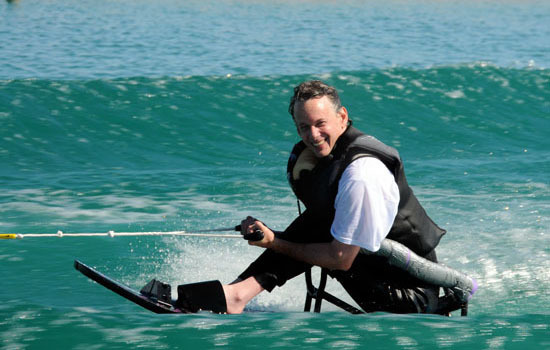 water skiing becomes a sport that people of all abilities can participate in. However, it is difficult for people with disabilities to utilize public lakes for many reasons. To begin with, the rough waters of public lakes create a greater than usual challenge for people with impaired balance or motor control. In addition, parking lots at most public lakes are located a significant distance from the boat dock. Typically, the slope from the parking lot to the dock is too steep to negotiate in a wheel chair. Finally, the great distance one must travel to a restroom at a public lake makes them inaccessible for many people with mobility restrictions. Designing a site accessible for people of all abilities has been one of the most rewarding challenges of Last Chance Lakes. A significant amount of planning occurred to make sure issues typical of public lakes were addressed and resolved. For example, the parking lot, restroom facilities, pavilion, lodge, and boat house are built on the same elevation. Furthermore, they are clustered within a couple hundred feet of each other, minimizing travel distance. Concrete paths, ideal for wheel chair travel, connect the amenities and meet ADA standards. And of course, the lakes are designed to remain smooth. The lakes at Last Chance are private and restricted to the use of homeowners and their guests with one exception, however. Last Chance Lakes is open on designated days to people with disabilities. The developers of Last Chance are excited to help create an opportunity of this nature. It's just one more reason why we are so passionate about this development.